Post marked ’38 Les Deux Alpes Isere 16H 22-3-1989′ and ‘Les 2 Alpes Dauphiné.Isère France 1650-3600m Ete-Hiver’ which reminds us that the Alps can be enjoyed in both Summer and Winter. Another 80’s status update from France – go high enough anywhere in the Alps on a clear day and you’re pretty much guaranteed a view of Mont Blanc, the highest peak in Europe. The cartoons on the front ring as true in 2015 as they did 25 years ago – in the big resorts there are still long queues at the lifts, the wide open pistes are still crowded and the ploughs still give little consideration to anything in their way. We met Robert on an earlier ski trip and, as was customary at the time, exchanged postal addresses with a view to possibly meeting up on subsequent holidays. I do not recall skiing with Robert again and we are no longer in touch. 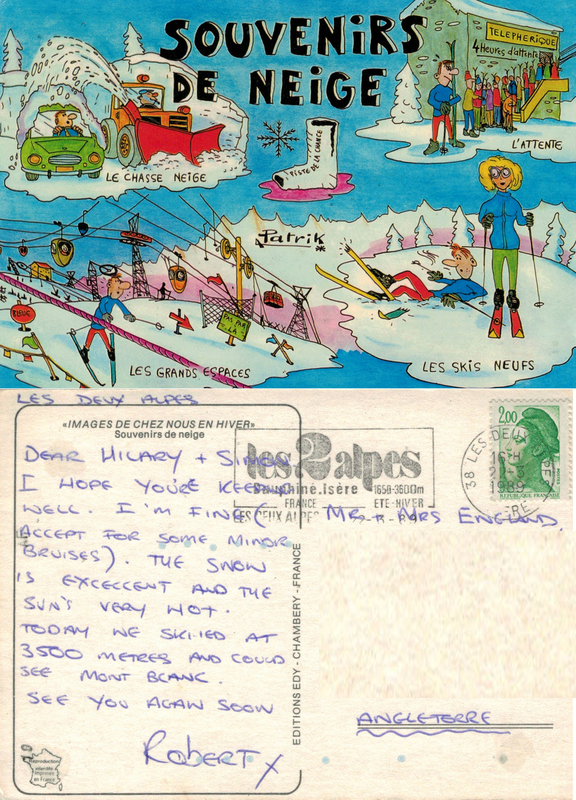 This entry was posted in Deltiology, Postcards, Travel and tagged Alps, France, Isère, Les Deux Alpes, Mont Blanc, piste, postcards, skiing, snow, status updates, winter. Bookmark the permalink.